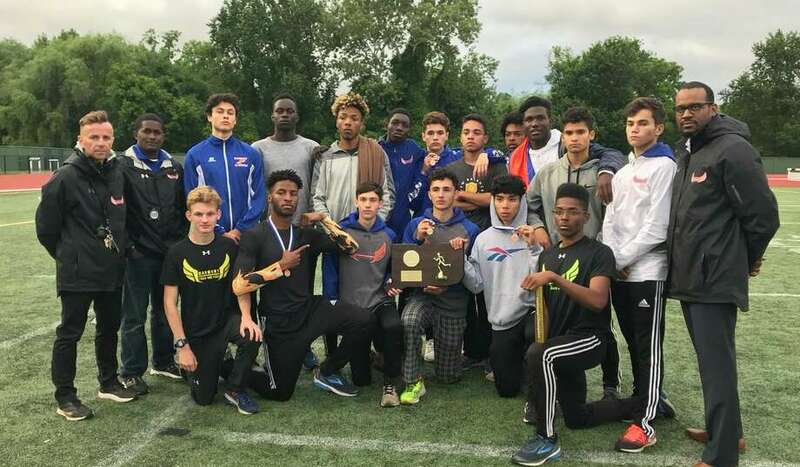 Danbury's boys track and field team poses with its 2018 State Open Championship Trophy at Willowbrook Park in New Britain Monday, June 4, 2018. The Hatters won three events, including the 4×400 relay to end the day, to finish four and a half points ahead of second-place Derby and take their first outdoor Open since 2011. “We lost last year and the year before in State Opens, and it’s really good to end my senior season with a win,” said Nate Llanos, who won the pole vault, as Dan Nichols did in the 3200. Danbury edged out Derby, which got wins in javelin from junior Brian Jalowiec (the day’s only repeat victory from last year) and in the 800 from Ken Little (beating his personal best by over two seconds). “It’s kind of bittersweet, because we felt like, going in, we had a shot to win,” Derby coach Nick DiLuggo said. “We actually scored above our seed scores. Staples, which got wins from William Landowne in the 1600 and Chet Ellis in a high-jump showdown, finished third, a point ahead of Bunnell, which took the 4×100 early in the day. But Danbury’s wins in the final two running events clinched victory. Leon Campbell of Hartford Public won both the 100 and 200. Hillhouse’s Deshaune Poole won the 110 high hurdles, helping the Academics finish 12th. Xavier’s 4×400 relay opened the day with a victory. Aren Seeger of Naugatuck won the 300 hurdles. Career’s Dyshon Vaughn took the long jump. One person who wasn’t in the long jump: McMahon’s Justin Forde, With a banged-up knee, he sat out to preserve his energy for the triple jump and the high jump. Forde won the triple with a personal-best 49 feet, 6.5 inches; he’d said breaking 49 was a goal. But he failed to clear 6-8 in the high jump, leaving Ellis alone at the top. Ellis was among those who said the weather hampered them. It was chilly, 60ish, breezy, overcast much of the day after morning rain. Forde said he wasn’t sure about going to the New England championships on Saturday in New Hampshire. Jalowiec set PRs in the discus (finishing third) and the shot put (fifth), he said. He watched in the shot as RHAM’s Michael Browning took victory away from Hand’s Mike Burchell on the second-to-last throw. Then he went back over to javelin for the finals. East Windsor’s Tristan Garrick had led there from the start with a 176-6 throw. On Jalowiec’s sixth and final throw, he went for 180-6. Garrick had one more throw, though, and Jalowiec thought it topped 180 feet. The two athletes stood on opposite sides of the foul line as officials stretched the tape measure. Jalowiec said he misread the tape at first, thinking it read 182 feet. It didn’t: It read 172-11. Jalowiec said he felt bad about his celebration, jumping in the air twice, but the emotion got to him. They came up just short, though they took a second-place plaque back to the Valley. Team scores: 1. Danbury 51; 2. Derby 46.5; 3. Staples 36; 4. Bunnell 35; 5. Hartford Public 30.5; 6. Manchester 23; 7. Stonington 21; 8. Norwich Free Academy 20.5; 9 (tie) Bristol Central 18, McMahon 18, RHAM 18; 12 (tie) Hillhouse 17, Hall 17; 14. Wilton 16; 15 (tie). Coventry 14, Naugatuck 14; 17. Bloomfield 13; 18. Windham 12; 19. Torrington 11; 20 (tie) Career 10, University 10, Windsor 10, Crosby 10, Hand 10, Xavier 10; 26 (tie). New Milford 9, Ridgefield 9; 28 (tie). Fairfield Prep 8, Trumbull 8, East Windsor 8, Fairfield Warde 8; 32 (tie). East Lyme 7, Simsbury 7, Brookfield 7; 35. Newtown 6.5; 36 (tie). Fairfield Ludlowe 6, Northwest Catholic 6, Coginchaug 6, East Hartford 6, Enfield 6, Cheshire 6, Haddam-Killingworth 6; 43. Plainfield 5.5; 44 (tie). Westhill 5, Notre Dame-West Haven 5, Ledyard 5, Darien Waterford 5, Lyman Hall 5, Sacred Heart 5; 51 (tie). Hamden 4, New Britain 4, Old Saybrook 4, Lewis Mills 5, Middletown 4; 56. Holy Cross 3.5; 57 (tie). Griswold 3, E.O. Smith 3, Weston 3, Berlin 3; 61 (tie). Seymour 2, Wilbur Cross 2, Shelton 2, North Haven 2, Tolland 2, Foran 2; 67 (tie). Amity 1, Metropolitan LC 1. 100: 1. Leon Campbell (Hartford Public) 10.93; 2. Elijah Henry (Bunnell) 11.02; 3. Deante Anderson (Northwest Catholic) 11.10; 4. Shayne Beckloff (Watertford) 11.11; 5. Christopher Pigatt (Hamden) 11.20; 6. Christ N’Dabian (Bunnell) 11.21. 200: 1. Leon Campbell (Hartford Public) 21.92; 2. Christopher Colbert (Wilton) 22.06; 3. Sean-Michael Parkinson (Danbury) 22.22; 4. Nigel West (Bristol Central) 22.31; 5. Dylan Hatajik (East Lyme) 22.40; 6. Alexander Halkias (Berlin) 22.45. 400: 1. Kymali Hay (University) 48.67; 2. Christopher Colbert (Wilton) 49.07; 3 (tie). Jason Walton (Plainfield) 49.12, Andre Valentine (Hartford Public) 49.12; 5. Jevin Frett (Manchester) 49.13; 6. Glenroy Ford (Danbury) 49.86. 800: 1. Ken Little (Derby) 1:52.05; 2. Miller Anderson (Hall) 1:52.93; 3. Ian Bartlett (Ludlowe) 1:52.98; 4. Joe Pearl (Manchester) 1:53.74; 5. Malcolm Going (Danbury) 1:53.85; 6. Rhys Hammond (Stonington) 1:53.96. 1600: 1. William Landowne (Staples) 4:12.60; 2. Alexander Mocarski (Warde) 4:12.87; 3. Trey Cormier (Hall) 4:13.96; 4. Alexander Korczynski (Windham) 4:14.30; 5. Benjamin Seiple (Staples) 4:15.12; 6. Timothy Lautenbach (Weston) 4:16.12. 3200: 1. Dan Nichols (Danbury) 9:09.91; 2. Drew Thompson (Fairfield Prep) 9:10.75; 3. Alexander Korczynski (Windham) 9:16.25; 4. Brendan Murray (Cheshire) 9:16.76; 5. Benjamin Seiple (Staples) 9:19.05; 6. Trey Corier (Hall) 9:20.86. 110 hurdles: 1. Deshaune Poole (Hillhouse) 14.57; 2 (tie). Nick Pronovost (Coventry) 14.60, Cameron Whelan (Stonington) 14.60; 4. Edward Williams (Sacred Heart) 14.62; 5. Aren Seeger (Naugatuck) 14.69; 6. Shemar Stewart (Bloomfield) 15.08. 300 hurdles: 1. Aren Seeger (Naugatuck) 38.00; 2. Marcus Manson (Windsor) 38.25; 3. Ja’Kwan Hale (Derby) 38.91; 4. Cameron Whalen (Stonington) 39.61; 5. Shemar Stewart (Bloomfield) 39.76; 6. Tylor Seamans (Lyman Hall) 40.10. 4×100: 1. Bunnell (Christ N’Dabian, Jonathan Cineus, Ramsley Exantus, Elijah Henry) 42.59; 2. Bristol Central (Pat Kjornrattanawanich, Dathan Hickey, David Bowes, Nigel West) 42.64; 3. Danbury (Christopher Cledera, Malachius Lorick, Jaden Cazorla, Sean-Michael Parkinson) 42.81; 4. Hartford Public (Andre Valentine, Leon Campbell, Zinodene Stewart, Malcolm Grate) 42.86; 5. East Hartford (Jaquan Allen, Isaiah Brooks, Jamar Eaton, Stuart Pike) 42.94; 6. Torrington (William Wilson, Christian Estefani, Naseem Thompson, Dylan Myrie) 43.21. 4×400: 1. Danbury (Phillip Melo, Glenroy Ford, Malcolm Going, Sean-Michael Parkinson) 3:20.87; 2. Manchester (Jevin Frett, Joe Pearl, Willy Joyner, Shawn Akomeah) 3:21.40; 3. Derby (Ja’Kwan Hale, Ken Little, Bevon McLean, Steven Stanley) 3:23.46; 4. New Milford (Michael Tarby, Luke Chastain, Chase Schuster, Charles Osborne) 3:23.66; 5. Hillhouse (Talib McBride, Dale Thompson, Naszier Torrence Robinson, Manasseh Bekele) 3:24.69; 6. Ridgefield (Aidan Williams, Simon Jupp, Kevin Arnold, Mitchell van der Noll) 3:24.96. 4×800: 1. Xavier (Pierre Sylvain, Owen Lally, Trevor Christie, Peter Schulten) 7:56.28; 2. Staples (Tyler Wright, Henry Haas, Luke Lorenz, Christian Myers) 7:57.14; 3. Ridgefield (Ethan MacKenzie, Charles Coffin, Kevin Arnold, Simon Jupp) 8:02.50; 4. Haddam-Killingworth (Andrew Meredith, Jonah Spector, Conor McCabe, Daniel Schumann) 8:04.59; 5. Old Saybrook (Luke Hanratty, Xavier Rios, Shane Henderson, Eric Sultini) 8:04.88; 6. East Lyme (Samuel Whittaker, Matthew Kung, Christopher Abbey, Ryan McCauley) 8:05.45. Pole vault: 1. Nate Llanos (Danbury) 14-0; 2. Christopher Weir (NFA) 14-0; 3. Joseph Hinckley (Stonington) 13-6; 4. Josh Appel (Westhill) 13-6; 5. Aidan O’Connor (Lewis Mills) 13-6; 6. Nick Petruzzelli (NDWH) 13-6. Shot put: 1. Michael Browning (RHAM) 55-7.25; 2. Mike Burchell (Hand) 54-1.75; 3. Nathan Quaye (Manchester) 51-8; 4. Michael Neary (Darien) 51-6; 5. Brian Jalowiec (Derby) 51-2; 6. Khaled Elmady (Brookfield) 50-1.5. Discus: 1. Bernardo Mbaya (Crosby) 157-10; 2. Michael Browning (RHAM) 153-9; 3. Brian Jalowiec (Derby) 150-8; 4. Jonathan Prell (Simsbury) 149-9; 5. Khaled Elmady (Brookfield) 149-4; 6. Ryan Williams (Newtown) 149-4. Javelin: 1. Brian Jalowiec (Derby) 180-6; 2. Tristan Garrick (East Windsor) 176-6; 3. Christopher Hebert (NFA) 171-9; 4. Joseph Venables (Coginchaug) 167-7; 5. Dylan Drescher (Middletown) 164-11; 6. James Day (New Milford) 163-3. Long jump: 1. Dyshon Vaughn (Career) 23-9; 2. Dylan Myrie (Torrington) 22-11.25; 3. Nick Pronovost (Coventry) 22-7.75; 4. Dathan Hickey (Bristol Central) 22-4.25; 5. Jack Jones (Trumbull) 22-3.25; 6. Davaughn Luty (Griswold) 21-9. Triple jump: 1. Justin Forde (McMahon) 49-6.5; 2. Elijah Henry (Bunnell) 47-2; 3. Sean Dixon-Bodie (Bloomfield) 47-0.75; 4. Jonathan Cineus (Bunnell) 45-2.75; 5. Collin Wiltshire (Ledyard) 45-1.25; 6. Jack Jones (Trumbull) 45-0.25. High jump: 1. Chet Ellis (Staples) 6-6; 2. Justin Forde (McMahon) 6-4; 3. Matthew Santy (Enfield) 6-4; 4 (tie) Ja’Kwan Hale (Derby) 6-4, Brenden Sholes (NFA) 6-4; 6 (tie) Zach Crebbin (Newtown) 6-4, DeAndre Wallace (Holy Cross) 6-4. Great showing by Derby, a school with 350 students total. Danbury over 3,000 total. Congrats to both great programs!! !